It always amazes me how much some folks complain about plying. Jeez, your yarn isn't yarn until it is plied! And isn't that what we are in this for - finished yarn to play with? For me, plying is like putting the hem in the skirt that is going to let me wear that new dress. Or putting the frosting on the cake that will make it beautiful!!! Many of my spinning friends and customers say they hate the process and blast through their plying with little thought and lots of speed! Yikes! I find plying meditative, and enjoy this final step in making my yarn usable. How exciting is that?! I like to take the time to see the twist go into the plied yarn and know that the finished yarn will look JUST like I want it to. That means keeping the process slow enough that I can actually SEE it. I often ply standing. I walk back letting the twist go into a long length; then take a step or two toward my miniSpinner to allow it to wind on. Doing this might reduce the boredom that some of you feel when plying. I also listen to favorite music, watch a movie or listen to an audio book, and have a lovely time. There also seems to be a movement out there to fill giant bobbins with singles. However, it only takes a half filled bobbin of singles (2 of them) to make a full bobbin of 2 ply yarn. So there is no need to have 2 full bobbins of singles. Even better, (don't take my word for it) as Judith MacKenzie and other knowledgeable spinning instructors would tell us; to get a more consistent yarn, it is more desirable to spin 1-2 oz of singles at a time, set them aside and finish ALL your singles for a project before you start plying. Why is this you might ask? As we know, our tension changes as we fill our bobbins. 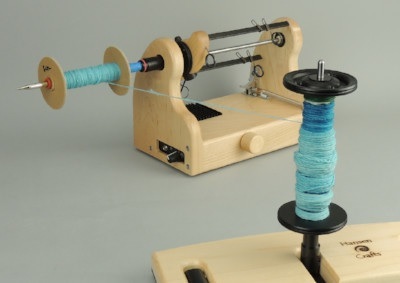 This change introduces the chance that the twist of the singles on the first part of the nearly empty bobbin may vary from the singles that were the last to go on that big, full bobbin. Why not minimize this by breaking down our fiber supply into 1 or 2 ounce (28-56 gram) units? Then when we go to ply, we can choose the singles at random to mix up any little variations....and, thereby even them out. Voila!!! A much more even yarn is the result! I also tend to wind off my singles onto storage bobbins using our quill as a bobbin winder. This way I am using very light bobbins, making tensioning a non-issue. Here is a little video that explains how I do this. For a little more plying information, and how to judge just how much twist to put in your plied yarn, check out our video Plying Lesson. Thanks for "listening"! Hope it will make your plying more fun, and you'll end up with better yarn!! !